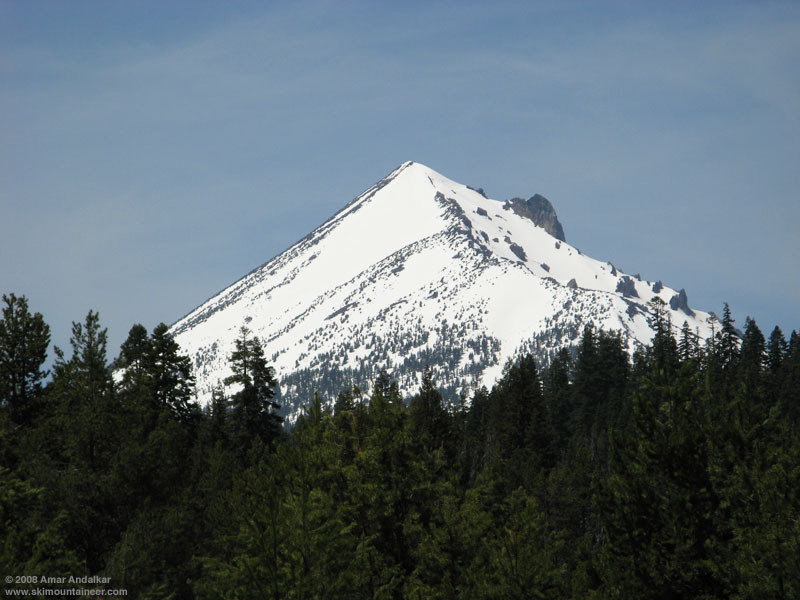 Following a fantastic day on Mount Shasta on Saturday (see� May 17, 2008, Mt Shasta, Hotlum-Wintun via Avalanche Gulch), I spent Sunday resting, writing that TR, and then driving north to my next objective, 9495 ft Mount McLoughlin in southern Oregon. I've skied McLoughlin several times over the years since 1999, ascending the standard route along the East Ridge and skiing either the excellent steep Northeast Face, or the slightly less steep but still fine Southeast Face. Somehow, I'd never managed to get there early enough in the season to ski the nice chutes on the southwest side (these melt out quickly in warm weather), and the imposingly steep 45+ degree North Face had eluded me too, even though it always had plenty of snow every time I'd seen it. Sometimes, it had been too firm for safety, and each time the reascent required to exit and return to the trailhead after skiing the north side had seemed daunting given my prior levels of fitness. The Northeast Face of Mount McLoughlin, reflected in a seasonal pond near the junction of Westside Road and Hwy 140. Being in better shape now, my original plan this time was to ascend the SW side (assuming there was enough snow), ski down the North Face till it flattens out (down to about 7200 ft), and then reascend to the top and ski the SW side back, for a manageable total of just over 7000 vertical. But several straight days of record heat and 15000 ft freezing levels would put a severe kink in those plans. Based on my experience on Lassen Peak a few days earlier (see other TR), I guessed that north or NE faces might have unstable snow conditions even early in the morning, with severe sluffing possible, while southerly slopes would probably be much more consolidated and relatively safe. I arrived at McLoughlin on Sunday evening, with plenty of time to scout out road access, snow coverage, and take some photos. FR 3740, which leads to 5200 ft Rye Spring and provides good access to the SW side, was still blocked by a deep snowdrift right at Hwy 140 (South Rye Sno-Park at 4700 ft), but looked bare beyond that, and snow coverage was very patchy and poor in the forest at that elevation. So I tried alternate access, taking FR 37 (aka County 821) north off of Hwy 140 and joining FR 3740 at its other end. But this too was blocked by a snowdrift near 4800 ft, with only patchy snow around. And even worse news: although unobstructed views of the SW side of McLoughlin are fiendishly difficult to obtain from anywhere near Hwy 140, I did manage to get a fairly complete view from a re-growing clearcut off of FR 3740-097 and it was not good. 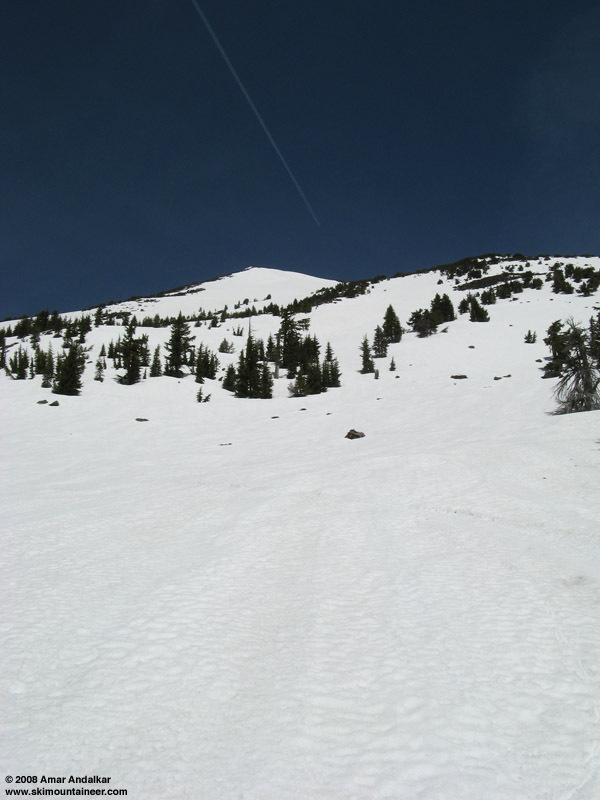 The upper part of the SW side above the chutes looked very rocky, and although there was still continuous snow to the summit, it was barely so and certainly not very nice for a ski descent. from a re-growing clearcut off of FR 3740-097. Well, time to make alternate plans. The Summit Sno-Park at 5050 ft on Hwy 140, which provides access to the SE side, had 1-2 ft of continuous-looking snow, right from the car. And snow coverage on the entire upper SE Face looked deep and continuous, in sharp contrast to the SW side. So my new plan was to ascend the SE Face directly from the Summit Sno-Park, and take a look at the North Face once on the summit. I car camped overnight at the lovely Great Meadow Sno-Park (the meadow is flooded now and looks like a lake), a few miles east on Hwy 140 at 4960 ft, which offers a view of the upper part of McLoughlin's cone and also the neighboring shield volcano of 7311 ft Brown Mountain, just to the south of Hwy 140. Sunset over the flooded Great Meadow, with Brown Mtn at left and McLoughlin at right. I had hoped to be heading uphill well before 6am, but by the time I finally drove back to the viewless Summit Sno-Park and skinned up through the forest it was just after 6:30, with a temperature of 39 F. The snow coverage was only about 50% at this elevation, but continuous with enough weaving and winding along the dirty twig-and-branch-covered corridors of snow. The topography of the south flanks of McLoughlin consists of a series of forested lava flows, forming numerous generally parallel, south-trending gullies about 20-60 ft deep. This makes it tedious and sometimes difficult to travel in a northwest direction (diagonally across the gullies) when the snowpack is shallow, and that's what is needed to aim directly for the summit (another longer option is to follow the snow-covered FR 3650 going NE from the sno-park, and then head NW at a higher elevation). I navigated mostly by dead-reckoning, with an occasional glance at the GPS which was generating a track just in case I needed it during the ski out. Brown Mtn at left and Mt Shasta at center. The snow coverage became much better above 5400 ft, and then deep and nearly complete by 6000 ft. The snow was solidly frozen and consolidated in the dense forest, but became much softer above 7000 ft as the forest thinned. Ski penetration was generally 2-4" while switchbacking up the steepening 30+ degree slopes above 7000 ft, and the slope was mostly stable, with only an occasional slip of the surface layer underfoot. I skinned up to 8900 ft where the SE Face hits the East Ridge, and the slope had steepened enough that booting seemed more efficient. The skis went on the pack, and I followed the mostly bare summer trail up the ridge, although clambering up the rough steep rock slabs of the trail was annoying in spots in AT ski boots. Above 9200 ft, the rest of the ridge is mostly snow-covered, and it was mostly easy step-kicking in well-consolidated snow the rest of the way, with only an occasional deep posthole into more rotten snow. I topped out at 10:45am, and was surprised that the summit area looked quite different than the previous times I'd been there: the stone foundation of the former fire lookout tower, long a prominent feature at the east end of the summit, has now almost entirely collapsed into a barely noticeable pile of rocks. Winds were light, SW 5-10 mph, temperature 48 F, and it was another sunny, beautiful, glorious day. and Upper Klamath Lake in the distance. Given the high temperature and my Lassen experience, I was almost certain that the North Face would be unstable. Yet it looked so smooth and inviting, appearing to be an endless untracked slope of perfect summer corn. After a half-hour break on the summit, I had to test it. First, I tossed a couple of fist-sized rocks down onto it, and they both planted themselves several inches deep without any snow motion. Not a great sign (which would have been penetrating only an inch or two, and rolling down the slope), but not horrible either (causing the whole slope to spontaneously sluff off). Time for a ski test: the uppermost 50 ft or so of the face is less steep, under 40 degrees, and then it rolls off to 45 or more, so it seemed safe enough to make a couple of turns on the upper part, and carefully watch what happens.� The first left and right turns were fine, but the next left set it off: a fast-moving sluff launched down the slope, entraining the upper 6-8" of snow. Time to get out of there! So I gingerly sidestepped back up about 20-30 ft to the summit, while the large sluff ran about 1000 vertical feet down the slope below me like a river of concrete. I'm very glad that I didn't risk skiing farther down the north side, especially because I was the only person on the entire mountain this day. Sidesteps leading back up to the summit and safety. A few minutes later I skied down the Southeast Face, making a couple of tentative turns at the top but quickly discovering that the slope remained nicely stable corn, even at 11:30am. Only a few minor rollers went down the slope, and no sluffs. Time to rip it up, carving big GS turns down the smooth untracked slope all the way down to the edge of the dense forest below 7000 ft. Snow quality remained very good throughout the descent, with only a few sticky areas just below treeline, and then was mostly semi-firm and fast down to 6000 ft in the woods. unfortunately lighting conditions make my ski tracks hard to see in the photo. The rest of the way back to the car was a bit of a chore, crossing up and down and over the same numerous lava flow gullies as on the approach, but my skin track was mostly easy to follow, and the GPS track helped me whenever the skin track faded. I even managed to take a more direct and efficient route on the way out, since I knew I couldn't get lost. Skied all the way back to the front bumper of the car, just after 12:30pm. The GPS showed about 9.3 miles round-trip, and the total gain was about 4700 ft. 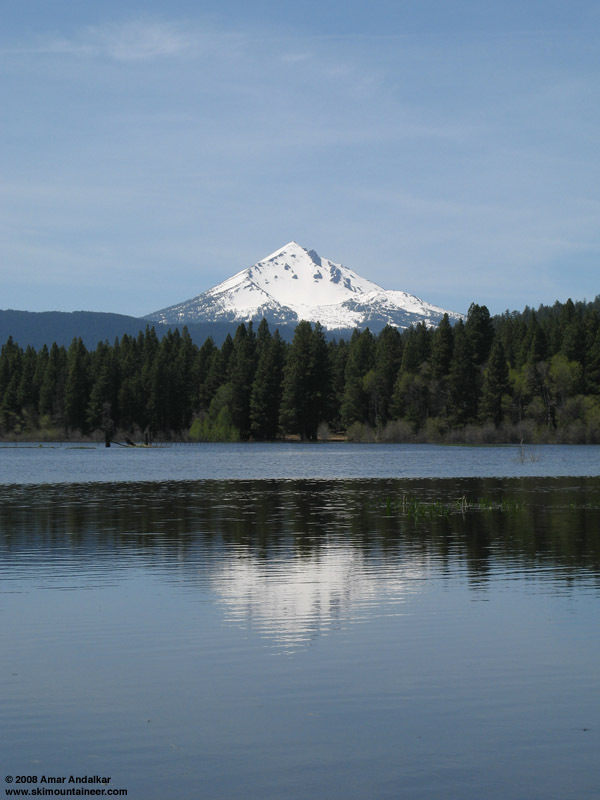 The Southeast Face of Mount McLoughlin from Great Meadow. It was a fine way to end my first road trip of the year to the southernmost Cascades, and despite missing out on the North Face yet again, it was great to enjoy the best corn snow of the entire trip on the Southeast Face. With the forecast for the next day calling for clouds and showers throughout the entire length of the Cascade Range from BC to California, it was time to enjoy an afternoon of photography and trip reconnaissance in the last of the sunshine while driving back north through the Oregon Cascades. First of all, FR 3661, which leads to the trailhead for the Mount McLoughlin summit trail and also to Fourmile Lake, is blocked by 1-2 ft of snow just a few hundred feet from Hwy 140. Pelican Butte: The NE bowls have excellent snow coverage. I didn't drive FR 3651 which leads to Cold Springs and to the road to the summit of Pelican Butte, but it's probably safe to assume it is blocked by snow above 5000 ft.
View of Pelican Butte from the NE along Sevenmile Road. Crater Lake and Mount Scott: Excellent coverage in the beautiful SE bowl / avalanche chute of Mount Scott, but only so-so in the NW bowl, where the uppermost part is already bare. Didn't drive FR 66 and FR 2308 off Hwy 97 (which access the SE side of Mt Scott), so no idea how far these roads are open. About 2-8 ft (?) of snow along the caldera rim at 7100 ft, but very variable. The first mile of west Rim Drive was supposed to be open, but according to the ranger it was temporarily closed due to an unexpected snow slide coming down. The rest of Rim Drive remains closed. showing the NW face and poor snow coverage. View of Crater Lake and Wizard Island from the south at Rim Village. Mount Thielsen: It looks like Thielsen is skiable up to about 8800 ft on the SW face, but getting thin up high. There is only 0-1 ft of very patchy snow at the 5400 ft trailhead, so it looks like a bit of a hike is already needed to reach continuous snow. View of Mount Thielsen from the southwest along Hwy 230. Mount Bailey: Excellent snow coverage on both the ESE-facing bowl / avalanche chute and very steep NE face. Best access is still as in winter, via FR 3703 from Three Lakes Sno-Park at 5400 ft on Hwy 230 where the road is blocked by 2-4 ft of snow. The other access from the north is also as-in-winter, blocked by a couple feet of snow at the tiny ski hill at the north end of Diamond Lake. The road along the east side of Diamond Lake is not yet plowed through, about 1-2 ft of snow at 5200 ft. The lake itself is still mostly frozen, but a few boats were breaking through the thin ice. Lots of very sluggish fish were so close to the shore, you could just reach out and touch them. at the junction of Hwy 138 and 230. View of Diamond Peak from the northeast along Hwy 58, with Mount Yoran at right. Thanks for the TR and conditions report - very useful (as usual). So, how long is your vacation? I've been reading your TRs jelously, waiting for school to get out so I can do my own road trip. Glad you are able to enjoy some sunshine and much skiing. Thanks for sharing all your adventures down south, as always a great read.� Vacation... you might not want to answer that question or they will really be jealous. Your book will be a significant resource for ski mountaineering, keep it up Amar!